The federal government will support clinical trials for a controversial multiple sclerosis treatment, Health Minister Leona Aglukkaq says. There is now enough evidence to proceed with clinical trials for the controversial vein-opening therapy for multiple sclerosis known as the Zamboni procedure, the federal government says. 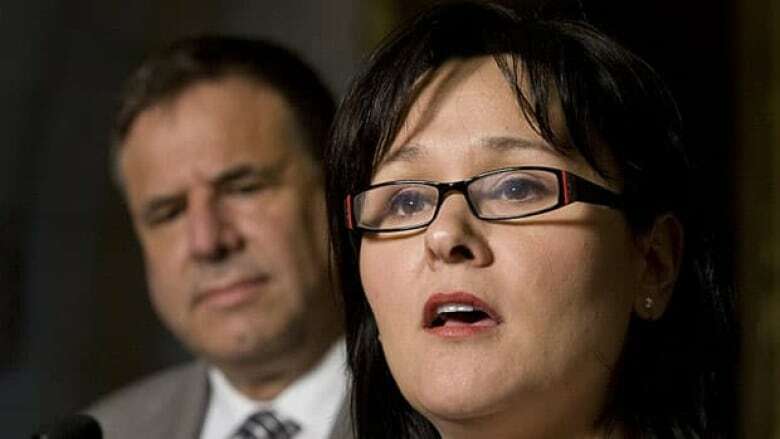 Health Minister Leona Aglukkaq announced Ottawa's support for launching pan-Canadian trials Wednesday afternoon in the foyer of the House of Commons. Earlier in the day, she received a recommendation to give trials the green light from the MS working group assembled by the federal government last year. The panel has been monitoring and reviewing evidence on Paolo Zamboni's theory that there is an association between MS and vein blockages, a condition known as chronic cerebrospinal venous insufficiency (CCSVI). The Italian doctor spearheaded a movement to use angioplasty to open veins and sometimes insert stents to improve blood flow to the brain. At the last meeting of the expert group in November, members determined there wasn't enough evidence to warrant clinical trials. It met again Tuesday, and, "the evidence is now here," the health minister said. "Patients and their families have been calling for funding of a clinical trial on a treatment to unblock veins. Our government has been clear that we are prepared to fund a clinical trial but only when there was sufficient medical scientific information to support proceeding safely," said Aglukkaq. The panel, which includes representatives from the Multiple Sclerosis Society of Canada, unanimously agreed that the government should now launch clinical trials. The government has accepted the recommendation and advised Canadian Institutes of Health Research (CIHR), its health research funding agency, to issue a call for trial applications from researchers. Clinical trials in Canada are categorized in phases and Aglukkaq said the government will move forward on phase 1 and 2 trials, which means initially a small group of patients will get access to the angioplasty procedure. The exact number will be determined by the proposals that are made by researchers. Aglukkaq thanked the expert panel for its work and had a message for MS patients and their families: "It has been a moving experience to meet many of you and to hear from so many MS patients and their families who have shown tremendous courage in the face of such a difficult illness." The federal government has been under pressure for more than a year to support nationwide clinical trials for the treatment, which MS sufferers across the country have been demanding. The procedure, also known as "liberation therapy," is not approved in Canada and that has resulted in patients who want it to travel to other countries and pay thousands of dollars for the treatment. Some have experienced vast improvements in their mobility and alleviation of symptoms, while others have had little or no change. The vein-opening procedure has its share of critics who say its merits haven't been proven and it is extremely risky. Canadians who have had the procedure abroad have reported having trouble getting followup care once they are home. The federal government had resisted involvement in pan-Canadian clinical trials until the results of seven major research projects on the procedure were known. Those studies are being led by MS societies in Canada and the United States. Dr. Alain Beaudet, president of CIHR and a member of the expert panel, said preliminary results from those studies were taken into consideration, as were the results from a meta-analysis study undertaken by CIHR. Beaudet joined Aglukkaq at the news conference and said CIHR reviewed all of the published research on CCSVI and MS and results from clinical trials outside of Canada. That analysis of research was shared with the expert panel on Tuesday and helped shift their opinion that clinical trials are now warranted, he said. The results show a trend of a prevalence of CCSVI among MS patients compared to healthy control groups, he said. "More studies will be needed, and particularly the results of the seven ongoing studies will be needed to strengthen this conclusion but nonetheless, the committee felt that on the basis of this preliminary evidence and what's published so far, that we should in parallel start already with a phase one [and] two trial," he said. Timing and the number of patients who will have access to the treatment will depend on the proposals. Beaudet said CIHR is hoping to receive and review all of the trial applications by the end of the year and get the trials going early in 2012. The first two stages of clinical trials will only involve up to about 200 people, Beaudet said. It's not until a trial proceeds to phase 3 that hundreds of patients are involved. Aglukkaq and Beaudet said they can't estimate how much a clinical trial will cost because it depends on which proposals are selected, how many patients they involve and how they are conducted. "Multiple Sclerosis patients and their families have been waiting far too long for a breakthrough in MS treatment and we share their optimism about the link between CCSVI and MS and the potential of the liberation procedure," Manitoba Health Minister Theresa Oswald said in a statement. "I am happy to see the federal government joining Manitoba, Saskatchewan and the Yukon in supporting clinical trials into the liberation procedure." Duncan Thornton, a Winnipeg writer, went to Poland last year spending about $10,000 to get the vein treatment. The announcement may be good news for MS patients in the future, but for those who are struggling with MS now, it may still take years before the trials result in a treatment they can easily access, Thornton said. "If I hadn't already had the treatment, I doubt if this would really make me think, 'Oh well , I won't travel, I'll just hang out for several years,'" he said. Federal opposition parties continued their criticism of how the Conservatives have handled the MS file. Liberal MP Kirsty Duncan, a vocal advocate of the Zamboni procedure, said she is pleased the government is launching clinical trials, but that it's taken far too long. "We have really lagged on this," she told CBC's Power & Politics. "Time matters in MS."
NDP health critic Libby Davies said the announcement is a "step forward" but agreed that it should have been made months ago. "It's taken the government an incredibly long time to even get to this point," she said. Davies also said this won't put an end to the political pressure MPs in Ottawa have been under to help patients access the treatment. She said the health minister should disclose all relevant information related to this decision, and provide more details about how the clinical trials are going to operate, and how much money will be dedicated to them. Nothing will change initially since there are still several research hurdles, said Jock Murray, an MS expert and physician in Halifax. "I think what people have forgotten is this is an extremely complex issue," Murray said. "It's going to have to be a very convincing trial, well designed, ethical, enough patients followed for enough time with the right outcomes to give the answers that people want to hear. That's not so easy." Saskatchewan is having trouble designing a trial that is acceptable, said Murray, who added he thinks it will also be difficult for the federal government.